There is an old saying in military affairs, that everyone wants to do strategy and tactics, but real men do logistics. That is, moving persons and materiel around and managing supplies seems tedious, but they are crucial to success. The Obama administration has substituted the Logistics of War for the War on Terror. It is moving troops and equipment and assets around in the millions, on a vast scale, and therefore its enemies–whether the Sunni radicals in Iraq or the neo-Taliban, are also concentrating on logistics. The staccato, desultory news items of bombings here and air strikes there, make sense if the individual incidents are viewed as struggles over supply lines– whether supply lines for military purposes, or supplies of intangibles such as international legitimacy. And in this context, the gingerness with which Washington is now approaching Russia and Iran makes perfect sense. The logistics war in AfPak were on full view Sunday, with the long fingers of blazing conflagrations jabbing the sky amidst billowing waves of jet black smoke both in Chaman in Pakistan near the Afghan border, and in Kunar Province. The bombing of supply trucks is to this war what u-boat attacks on supply ships were to the two world wars. 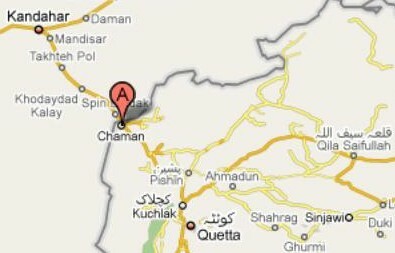 In Chaman, Dawn reports, “At least 15 oil tankers, trailers and containers caught fire in Chaman on Sunday night after a blast in a vehicle carrying supplies for Nato forces in Afghanistan.” The NATO supply vehicle became a sitting duck because the border between Pakistan and Afghanistan has been closed for the last few days over a dispute about whether Pakistani border guards may search Afghan fruit trucks. Meanwhile, a different sort of supply line was hit in Mingora in the Swat valley, when a Taliban suicide bomber killed 16 recent police recruits and wounded 5 others. The Pakistani Army had attacked the 4,000 Taliban fighters that were dominating Swat this spring, much to the annoyance of the people of Swat, and had largely expelled them. But obviously furtive Taliban terrorist cells are still able to operate there, even against police stations. The point of these special operations police recruits was to make the expulsion of the Taliban permanent. On the Afghan side of the border, militants from the Hizb-i Islami or “Islamic Party” of Gulbadin Hikmatyar “stormed a NATO supply convoy and torched at least 10 vehicles in the troubled eastern province of Kunar,” according to Pajhwok News Service. Meanwhile, the Taliban have used pockets of Pashtun populations in the north of the country as a base to take over three districts that allow them to block supplies coming in from Tajikistan, according to McClatchy. These setbacks are taking place even as US missiles slammed into a base of the militant Haqqani group in eastern Afghanistan, allegedly killing 35 guerrillas. The Haqqani group is cooperating with the Hizb-i Islami and with the ‘old Taliban’ of Mulla Omar in attempting to undermine the Kabul government and its NATO backers. Both Hikmatyar and Jalal al-Din Haqqani were assets of the Reagan administration in the 1980s fight against the Soviets and they received large amounts of monetary aid from Washington, but have now turned on it. In any case, the Taliban are obviously attempting to cut the supply routes that allow the US and NATO to keep their troops supplied with ammunition, fuel and food. The hundreds of ballot fraud complaints now flooding into the offices of election monitors in Afghanistan threaten to deny legitimacy to the presidential election and thence to the Kabul government itself. In essence, the Obama administration and NATO intended those elections to form a supply line of international and domestic legitimacy, which has now been disrupted, apparently in some large part by partisans of President Karzai. At the same time that NATO and the US are trying to move troops and materiel into Afghanistan, the US is attempting to move 1.5 million pieces of equipment out of Iraq, according to AP. Moreover, all but 40,000 US troops out of 130,000 now in country should be out by next year this time. Just as the supply trails into Afghanistan are vulnerable, so too are those out of Iraq. Much of the materiel is being put on trucks and taken south through Mahdi Army and Badr Corps (Shiite militia) territory to Kuwait in the south. Other trucks ply the once-perilous road between Baghdad and Aqaba in Jordan, going through sometimes hostile Sunni Arab territories. As the US forces and military equipment in Iraq dwindle, the remaining troops become more vulnerable. As for the southern route, the major forces that can convince the armed Shiites to let the US leave in peace via Kuwait are the government of PM Nuri al-Maliki, which has been positioning the new Iraqi Army in the south and cultivating tribal levies there, and the Iranian government of Supreme Leader Ali Khamenei and President Mahmoud Ahmadinejad. Should relations take a very bad turn for the worse between the US and Iran, the danger of Shiite militia attacks on the US convoys would spike. Also in Afghanistan, the US increasingly depends on Russian good will, and Iran is influential in Herat, Mazar, the Hazarah regions and Kabul. Iran can play a positive role in its two neighboring countries, de facto acting as an ally of the US. Or it could play spoiler. Obama’s presidency may succeed or flounder on his success in the recondite art of logistics, both in the strict military sense and in a wider metaphorical sense, of putting the right personnel and “assets” in place for political victories. In that regard, Iraq could well be a big win. AfPak, so far no so much.